Caseload Manager includes the ability to pull information from your Case Record to your Mail. You may use this information to send an email, an invoice, download a pdf of a case record, or print out important case documents. You may save text substitutions in a stored template, by clicking New Template>Edit in the Stored template list in the upper-left. 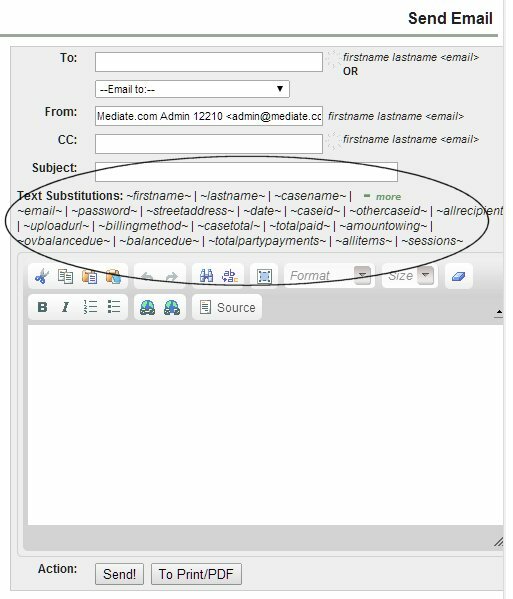 Then type the content of your template, including text substitutions, and click "Add to Stored Emails." You may also just write your own email, without using a template, and enter in the text substitutions as you type. These substitutions will insert the relevant information from the Case Record upon emailing or printing. Please test the substitutions yourself to understand exactly how they work, or contact the Mediate.com office for a demonstration. Custom case and participant fields and person types can also be added to text substitutions in the Mail Hub. You must create these custom fields in settings to be able to use them. The picture below is an example of substitutions that have been created in a model account. After you create custom case and party fields, you can create your own text substitutions. They will not necessarily appear in the substitutions list, so your screen will look different than the one below. 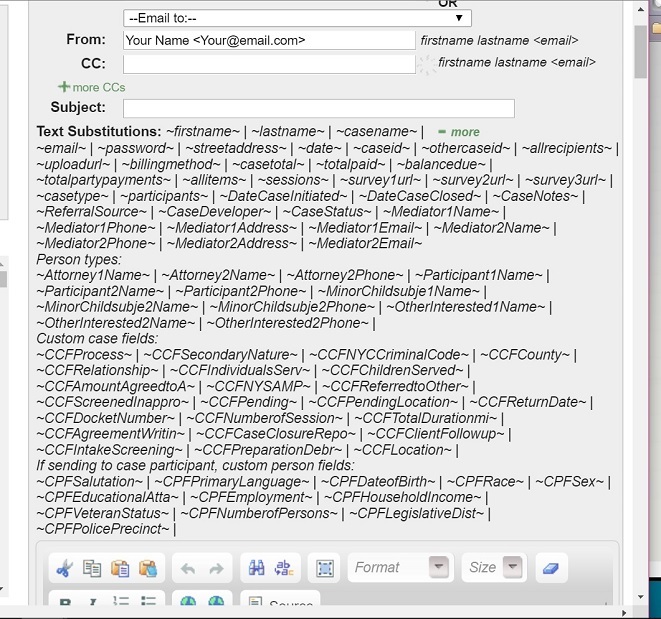 To determine the text substitution wording, use CCF for a Custom Case Field and CPF for a Custom Party Field. Then use the next 15 letters of the field. If you have used characters in your field name, ignore those and move on the letters. As an example, if you have created a custom case field entitled Screened: Inappropriate, then the substitution code is ~CCFScreenedInappro~ Removing the special characters and the space, you have 15 letters of text, which is ScreenedInappro. CCF precedes the text because it is a Custom Case Field.